Duk Ling fishing boat in Victoria Harbour. 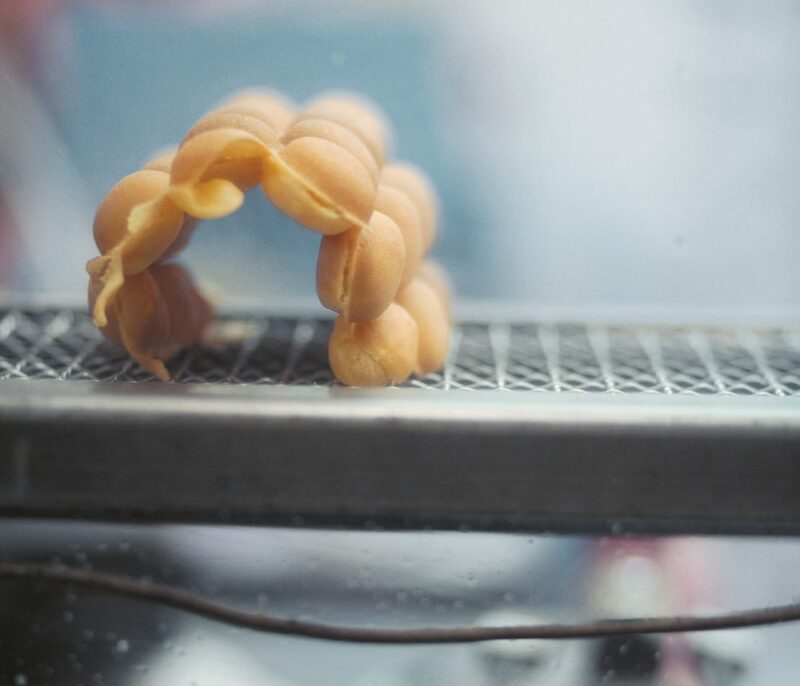 Egg puff waffle, a popular Hong Kong street food. 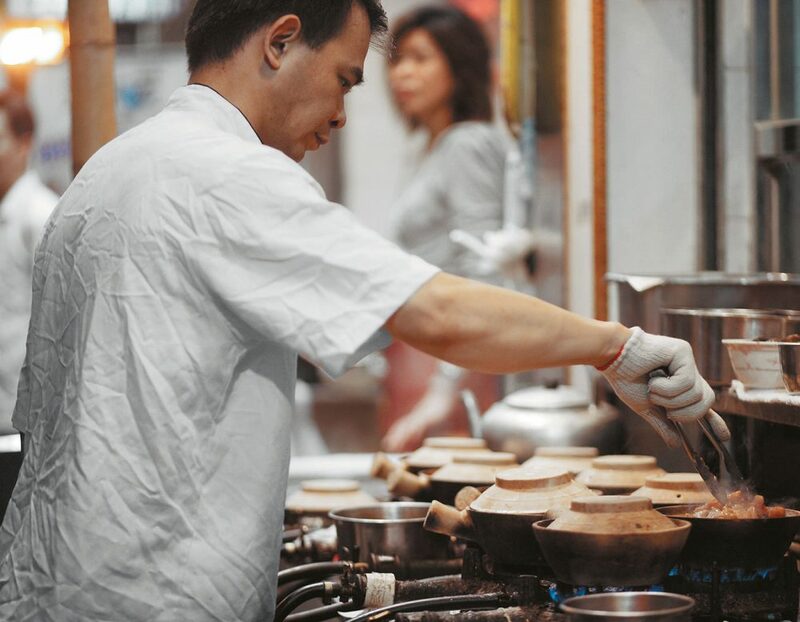 Claypot rice prepared at one of Hong Kong’s myraid coffee shops. 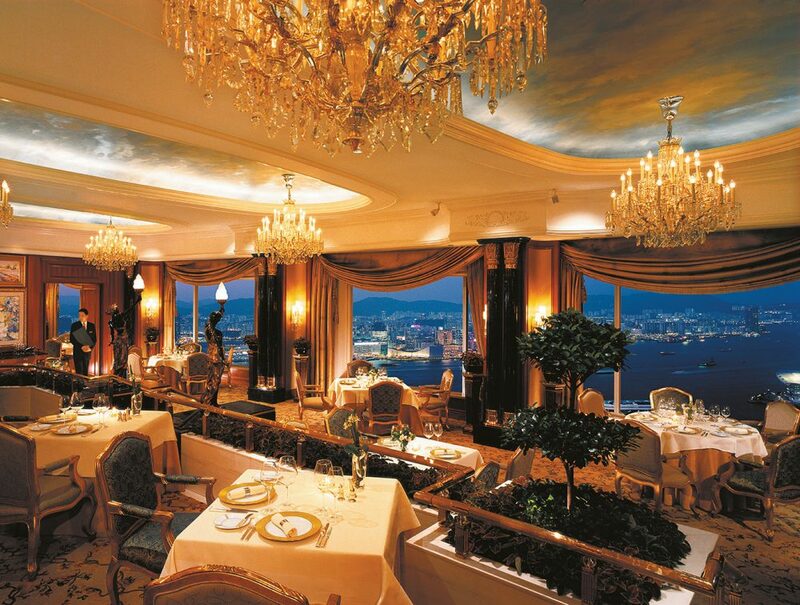 Restaurant Petrus at the Island Shangri-La Hotel, Hong Kong. 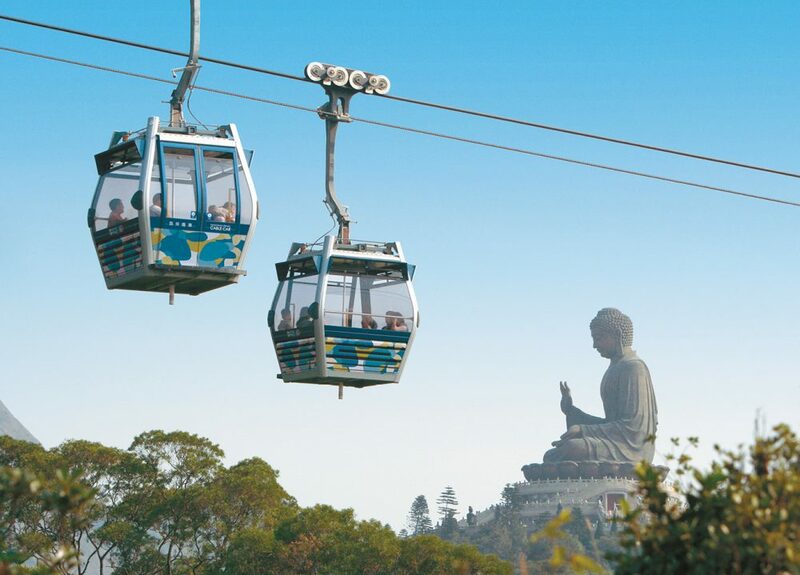 The Ngong Ping 360 sky lift, overlooking the massive Tian Tan Buddha. There’s a drink available at the myriad coffee and breakfast shops in Hong Kong that goes by the name yuanyang. It’s made by combining tea and coffee—the precise proportion of which is apparently both secret and integral—with a bit of evaporated milk. It has an odd taste, sort of silky on top with a slightly bitter aftertaste. For those accustomed to meticulously pulled shots of espresso, a tea coffee blend might seem, well, unusual. Yet it is certainly worth trying, even for caffeine-conservative visitors, if only to be able to tell the friends back home about it. And chances are, once you get to the dregs, you’ll find you’ve acquired the taste. It’s actually quite good. 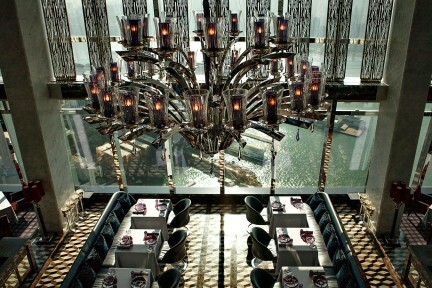 The drink is an appropriate symbol for Hong Kong as a whole: a metropolis of mixed elements, two sides coming together. East meets West, for sure; like many major Asian cities, Hong Kong has its Western elements that complement the Eastern culture and history. It is unquestionably a financial centre, geared toward high finance and big business, yet it is also a place of pleasure, where food, drink, retail browsing, sightseeing, and leisure are popular pursuits. The result has been a perfect storm of culinary and wine excellence. The Michelin guide succeeded in amping up excitement for Hong Kong restaurants. Similarly, the removal of the wine tax has led to a surge not only in wine buying (within a few months, wine imports soared more than 75 per cent), but also in enthusiasm and education. “These days, customers are more committed to learning, to gaining knowledge. They’re very passionate about it,” says Lysanne Tusar, the founder, director and chief marketing officer of Hong Kong’s 8th Estate Winery. Yes, a winery in Hong Kong; Tusar and her team select grapes from around the world, which are flash frozen and shipped to the winery in the city, where the wine is produced. 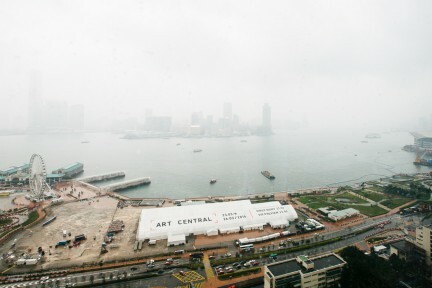 This notion of wine produced within the city itself has seen a great deal of customer enthusiasm, and indicates the city’s enthusiasm for Hong Kong–based experiences. The Louis Vuitton flagship store is one of the company’s busiest in the world. Similarly awe-inspiring are the multi-storey shopping malls, gargantuan retail spaces that feature numerous storeys and mazes of escalators. Customers’ attitudes are evolving, which is leading to changes throughout the industry. “When the inaugural Michelin guide was published, it made Hong Kong’s best-selling book list,” says Le Nouvel. 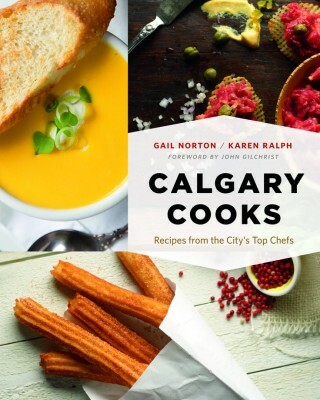 “That clearly shows how much peoples’ lives revolve around food and dining out in the city. 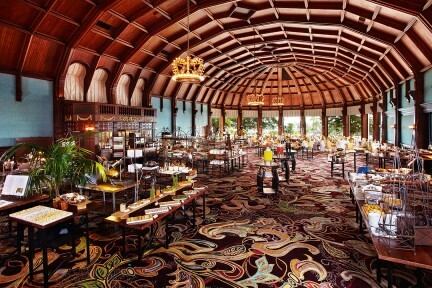 The guide also gave us the opportunity to review the hotel’s consistency and practices in terms of service, food and the overall dining experience. We were inspired by the results, because we viewed them as an opportunity for self-assessment and to ensure continuous improvement. Additionally, we sent our chefs away on fact finding missions and culinary tours to further enhance their culinary knowledge and horizons.” Thus the guide has fuelled a sort of self-fulfilling prophecy; as the customers become more adventurous and willing to experiment, so too are the chefs becoming more eager to showcase their culinary skills. The upshot of all this is that the invigorated wine and dine scene has augmented the other elements that make Hong Kong such an eminent destination. Especially the shopping. Shops are everywhere, on nearly every street, and vary in scale from mom-and-pop tea shops to world luxury brands; the Louis Vuitton flagship store is one of the company’s busiest in the world. Similarly awe-inspiring are the multi-storey shopping malls, gargantuan retail spaces that feature numerous storeys and mazes of escalators. Yet some of the most memorable experiences come from the smaller stores. There are markets everywhere, some with specialties, like the jade market, or the wet market, which is filled with food stands selling fresh fruit and every kind of meat imaginable. Tea shops, as expected, abound. Small Hong Kong cafés are ubiquitous. Visitors are also likely to stop and ponder at the occasional shop that looks like a small café and features turtles—live turtles—in the windows. These places specialize in a jelly made out of turtle shell, which is said to be good for the skin. 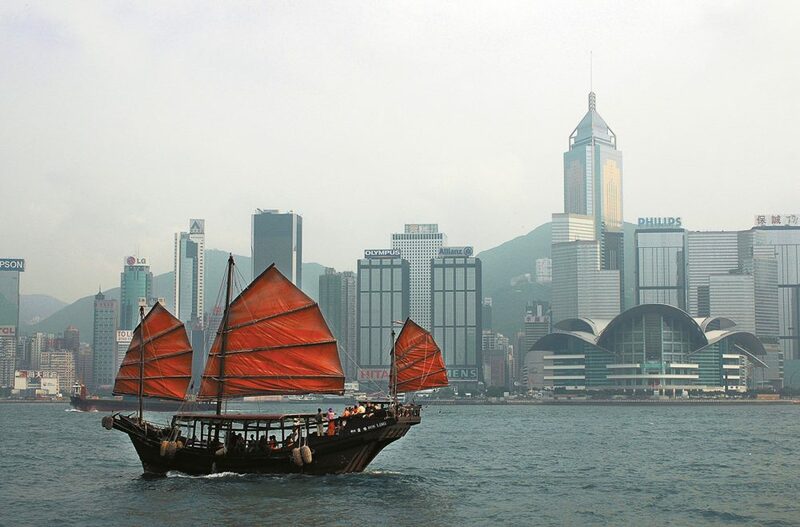 Many other activities are worth a look for a fully rounded visit to Hong Kong. Lantau Island, which is actually the largest island in Hong Kong, features a number of hiking trails (including the 70-kilometre Lantau Trail walking path), as well as the Ngong Ping 360 (a sky lift that provides incredible views on the way up) and the massive Tian Tan Buddha near the Po Lin Monastery. Stanley is a town located on a scenic peninsula on the south side of Hong Kong Island. The road through the hills toward the coast—although full of double-decker buses that pass precariously close to one another—provides plentiful beautiful views. Stanley is a relaxation destination, with many beaches nearby, a thoroughly expansive market and a gorgeous beach boardwalk that looks out into Stanley Bay and the South China Sea. But these days, the restaurant and wine scene is invoking real excitement. Hong Kong is the same, but more. Just like in the yuanyang, it’s this mix, this precise combination of elements, that’s so integral to its success. All other photos: Hong Kong Tourism Board.